Hi Everyone! Hope you are having a great week. It's Wednesday and time for a new challenge at The Perfect Sentiment. This week is everyone's favorite challenge: Anything Goes! I used one of my favorite Webster's Pages Collections, "Waiting for Santa/Sweet Season". This collection is probably now retired but, I have a nice stash of it left. This card also gave me a reason to try out my Frosty Border die by Memory Box. It's hard to tell here but it's actually very elegant. And of course I used one of my favorite sentiments from Verve's Bright Spirits stamp set. Thanks for stopping by! I hope you are blessed. Beautiful creation hun, love the colour combo its really striking! Very pretty. I love the dp that you used on this and a gorgeous layout. Beautiful!! I tend more to the traditional red/green for Christmas, but I love this!! Wonderful card with a great sentiment! Love the fab flower and the die cut flourish! Thanks for joining us at LEJ Designs! Very pretty Jennipher! Love that color combo....TFS!!! Lovely card!, Love the paper that you've used! 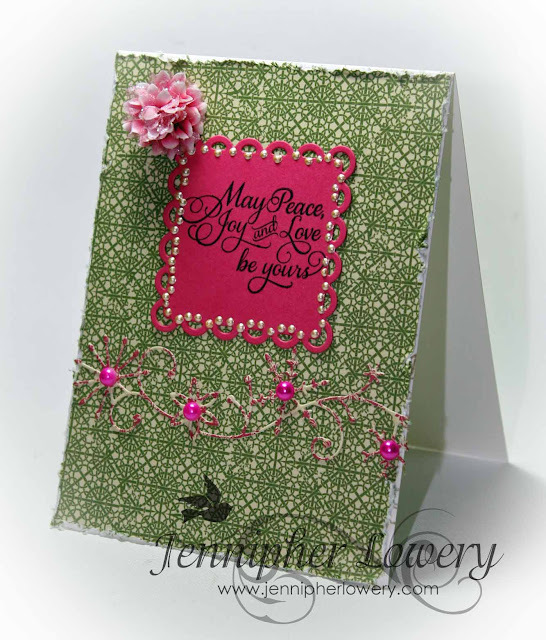 That border die is so delicate and pretty! I think pink and green works well for Christmas. Have a wonderful long weekend. What a very different and unique christmas card. 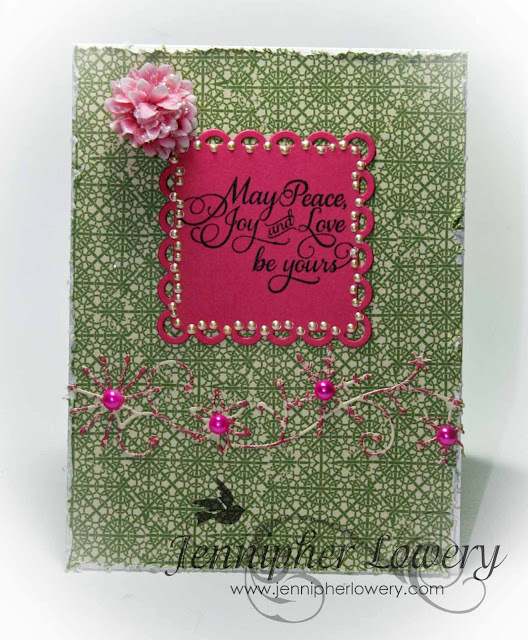 Lovely colour combination and gorgeous diecuts. Beautiful card, loving that border. You make some of the most elegant cards I've seen. It's been a while since I visited your blog and I just love looking through your creations! I never thought about using pink and green for Christmas cards but seeing your card I must say I really like it. Your card is a very different Christmas card and it is perfect. I love the border die by Memory Box. You are right it looks very elegant. And I love the sentiment. i love using pink/green for the holidays :) beautiful card! just a friendly reminder to be entered in the challenge for lawnscaping you can enter your card in up to 3 challenges. thank you for playing a long!